I’ve had cake on the brain lately. Maybe that’s because I’ve been trying not to eat cake, and so all I can think about is eating cake. But also, around here it’s cake season (to everything there is a season). 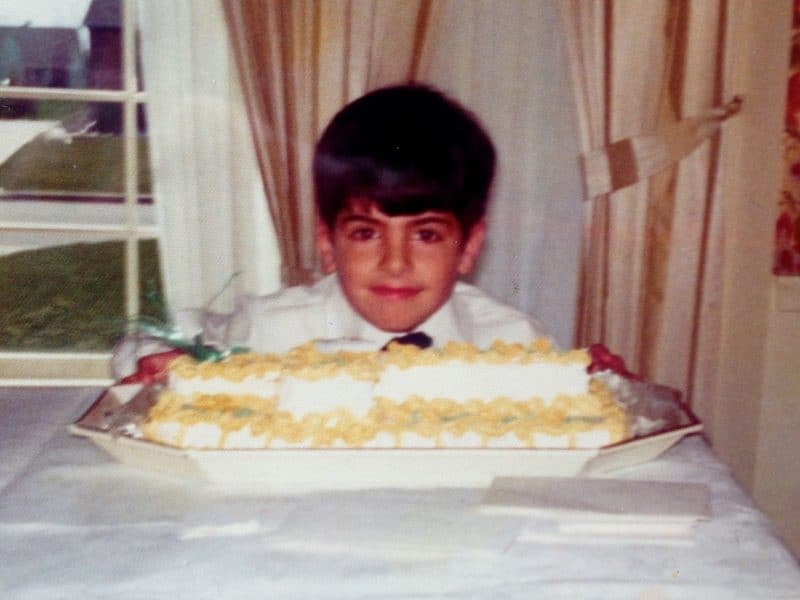 There are First Communions in spring, which my grandmother Alice Abowd always graced with her specialty cakes. 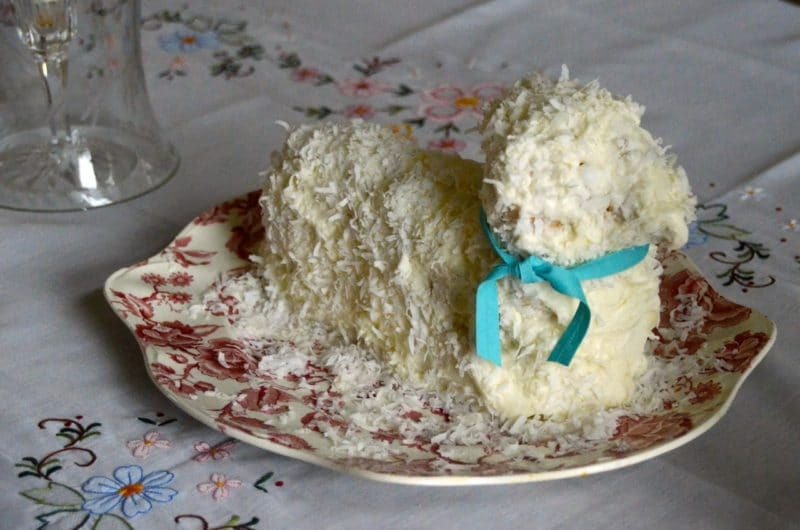 There was a piped cross cake, and a coconut lamb whose molds we still have (perfect for my nephew’s Communion cake this week). There used to be spring cake-walks at our parish carnival, too. You’d walk the circle until the music stopped playing and if you were standing on the number drawn from a hat, you won a cake. Brilliant. And there is Mother’s Day, a cake-worthy event if there ever was one. One particular Mother’s Day probably 15 years ago, maybe more but I can’t go there, my sister and I headed back to Michigan from Chicago to celebrate with Mom. Dad was with us back then, and my brother was in Michigan too. We loaded the car with over-the-top treats, including a big bucket filled with the most gorgeous roses I’d ever seen. They were a perfect shade of fuchsia and the underside of the petals was chalky pink; they blossomed into big, loose ruffles that filled both hands put together around them. I’d seen a few of the roses in the floral display at Treasure Island grocery store, and asked what they were, and could they get me several dozen? I swore I would never forget the name of that rose, so that I could always ask for it by name (and now: name forgotten). There was also a Mother’s Day cake whose name was never forgotten. It was a tall, three-layered, handcrafted beauty steadied on the floor in the back of the car in a big blue box from Tiffany. A stately coconut cake was worthy of that box. But this coconut cake? I’d rather forget it and remember the roses. But nobody will let me. Imagine the white tower of a cake on the kitchen table at home, a proud display of daughterly love on Mother’s Day. Here was a confection of the highest order. Beautiful inside too, layers of meringue icing that stood firm and grand. We sliced into the cake immediately, all formalities and any right-before-dinner hesitancy aside. The table was pretty quiet as we forked up the thick bites. I looked up from mine and caught my brother and sister mouthing something to each other. What? I said, What what!! They threw down their forks, I kid you not, and told me in the dramatic terms they are experts at that my cake was inedibly dry. And flavorless. Dry, flavorless, and what’s for dinner anyway? Fine. I agreed. It was not a good cake. It was a vain cake, pretty to look at with no character underneath it all. 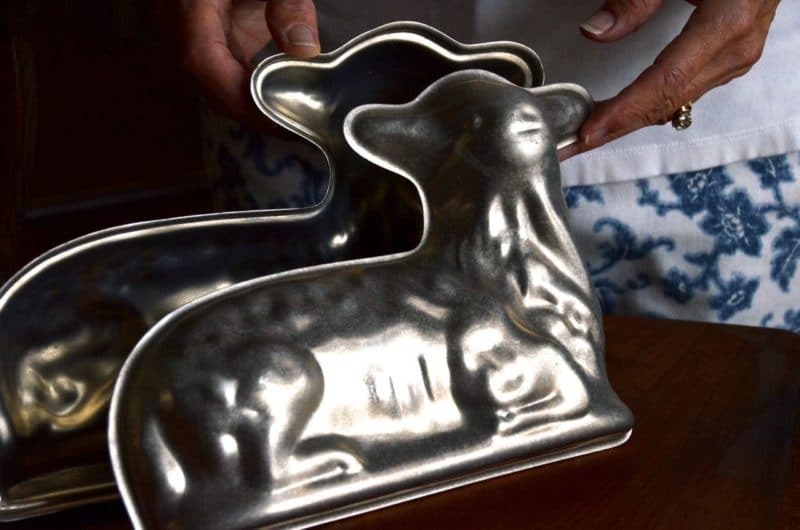 I was so irritated at Martha Stewart for giving me such a fail that I still fear a misfire every time I try something of hers (but then there were these, and the world was set straight). It’s something none of us can forget, not unlike that one time when I was a kid and got so irritated by all of the sibling harassment that I threw the TV remote at my brother (I’m sorry, I really am), and still today we’re both stunned that I did it. Same with the cake. That stunningly bad display of bait-and-switch, of looks pretty/tastes bad still comes up, and its haunting has made me less of a cake baker than I would otherwise be, I’m sure of it. So here you go. I’m done running from the coconut cake, or any white cake for that matter. Done accepting that they taste bad (often of raw flour, or something like that). 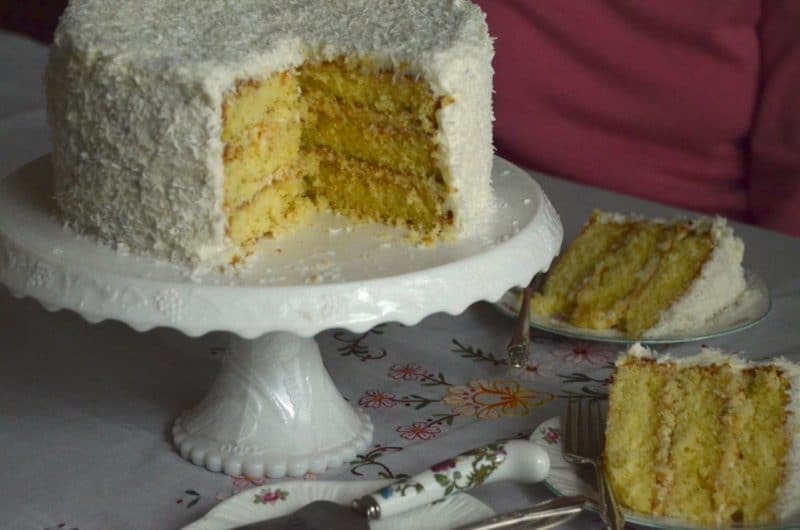 I’ve tried many if not all of the approaches to a coconut cake, and this one is a winner for its deep coconut flavor and, of course, its moistness (if that means accepting a scoop of shortening, so be it). I feel certain Grandma Abowd would approve for her lamb cake, certain I’d pick this one if my number came up in a cake-walk, and positive I’ve finally made good on a cake worthy of spring cake season. 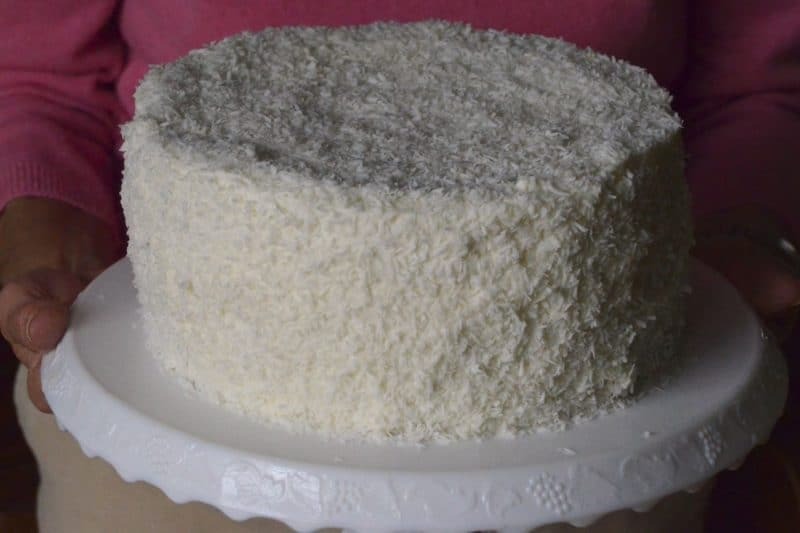 The unsweetened coconut is a perfect way to impart more coconut flavor to the cake without more sugar, but sweetened flaked coconut is a fine substitute. The orange blossom simple syrup adds moistness to the cake and a layer of flavor that enhances the coconut beautifully. Preheat the oven to 350°F and place a rack in the center position. Coat 3 9-inch cake pans with butter and line the bottoms with parchment circles. 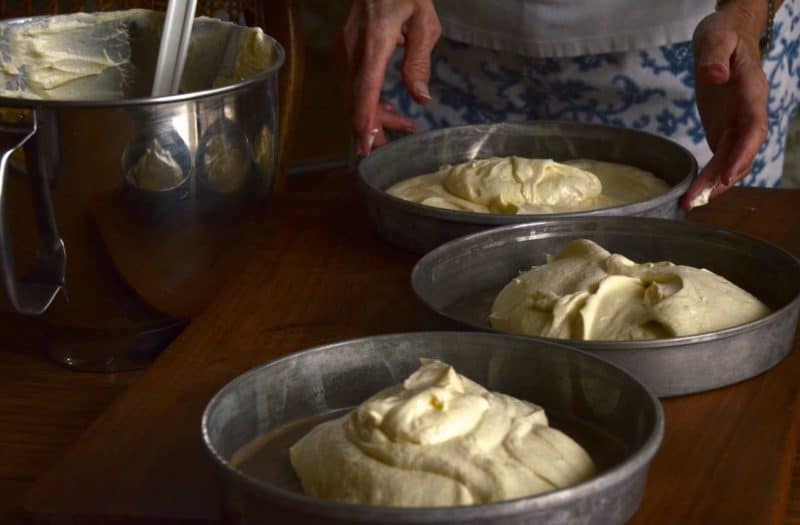 In a stand mixer fitted with the paddle attachment, cream the butter and shortening on high speed until they are light and fluffy. On medium-low speed, add the sugar one cup at a time. Once the sugar is incorporated, increase the speed and beat until the mixture is light and fluffy again, about 3 minutes. Crack the eggs into a bowl, then add them one at a time to the butter mixture, beating to incorporate each egg before adding the next one. In a medium bowl, whisk together the flour, baking powder, and salt. In a glass measuring cup, combine the buttermilk, coconut milk, and coconut extract. On low speed, alternate adding the flour mixture and the buttermilk mixture into the batter in several additions, beginning and ending with the dry ingredients. 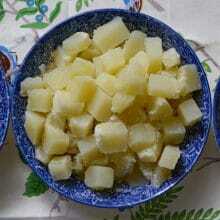 Stop to scrape down the sides of the bowl as you go, and beat just until each is incorporated. Divide the batter evenly among the three cake pans and smooth the batter into each pan. 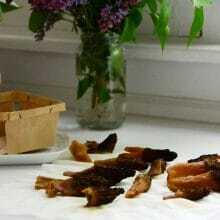 Bake the cakes for 25 to 30 minutes, or until they are golden, spring back lightly when touched in the center, and a toothpick inserted in the center comes out clean. Cool the cakes in their pans for 10 minutes, then remove the cakes and cool on wire racks. 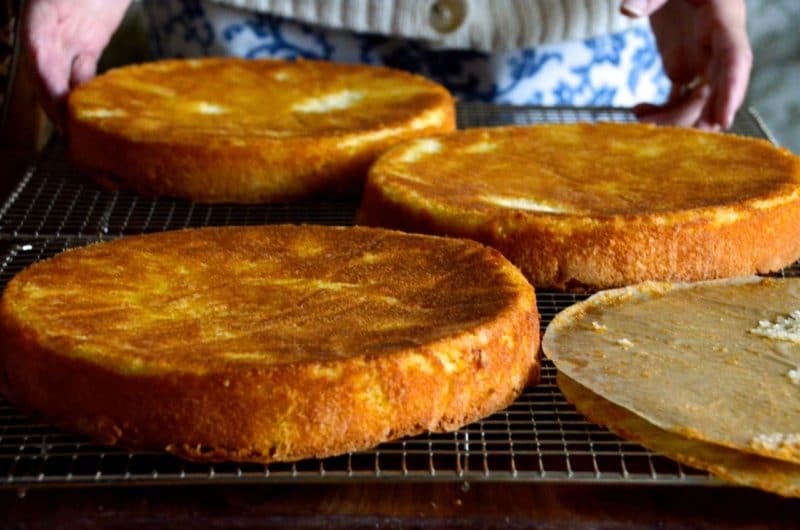 When the cakes are completely cooled, brush the tops and sides with orange blossom simple syrup. For the buttercream, beat the cream cheese and butter in a stand mixer until they are smooth. Beat in the coconut extract. Sift in the powdered sugar one cup at a time, incorporating on low speed and adding a tablespoon of coconut milk after every cup or two. Beat the buttercream until it is smooth and light. To assemble the cake, place one layer of cake on a serving platter or cake stand. Top it with about a cup of buttercream and spread it evenly. Center the second layer on top of the first layer with buttercream, and top with another cup of buttercream, spreading it evenly. Center the third cake layer on top, and spread the buttercream evenly over the top and sides of the cake. Sprinkle the coconut over the top and sides of the cake in small handfuls (it’s messy, but that’s okay; just brush the excess coconut from the rim of the cake platter before serving). Serve the cake immediately, or chill and serve within a day or two. 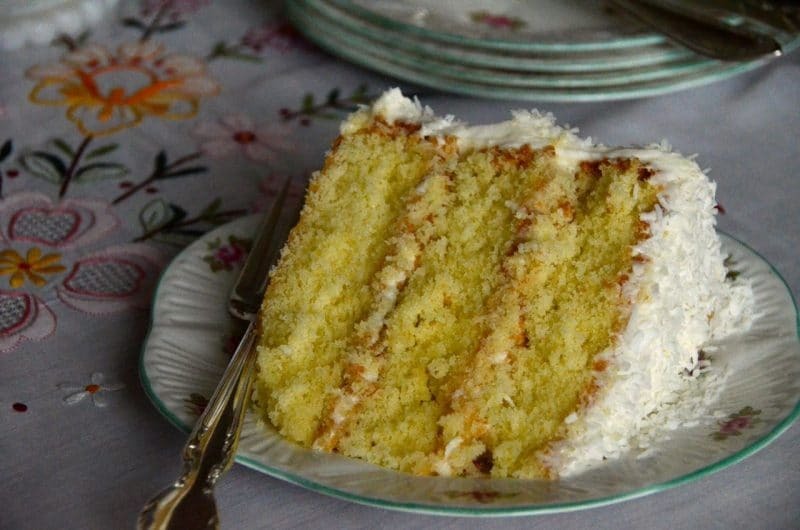 11 Responses to "Triple-Layer Coconut Cake Recipe"
Maureen, you had me at Coconut Cake. And may i just say, look at those three layers on the cooling rack–perfection. I think I make a mean coconut cake but I can see your version is a real contender, and for sure a winner! Thanks for sharing. Smiles and warm tears as always–lovely writing–and, a most beautiful cake–and, beautiful children with ‘zeitoun’ for eyes–my Aunt Louise always said that of me when I was a child!! Gotta love the LOVE! I hope this cake is as wonderful for you as it is for me–and I’d love to hear how you like it! YES! YES! YES! I can’t wait to bake this cake. I have deep love for anything coconut and we always adored Aunt Mary’s show stopping lamb cakes!! Now I have a triple reason to enjoy cake season. I think I may have used the same Martha Stewart recipe many years back. I too was very disappointed. It was beautiful and i was excited for weeks before to take such a beautiful cake to my church function. Dry and no flavor. Thanks for the new coconut cake recipe! Now I understand how you came across my First Communion picture! 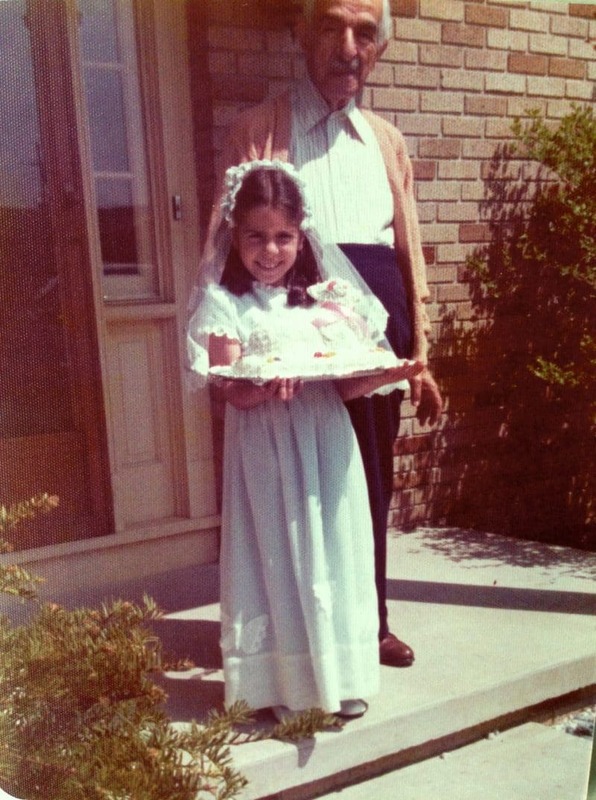 Oh my Lord I LOVE the picture of you with that cake and your Grandpa! How adorable these pictures are! oh my that lamb brings back memories of church chicken barbeques and the “spin-the-cake” wheel! Maureen, I want to bake your coconut cake this Monday for my dear friend’s birthday. The orange blossom water worries me a bit. I find that this smells more like laundry water. Not natural. Am I just buying the wrong brand ? I was able to find only “Ziyad”. Is there a substitute to this ? What if I just made a fresh orange juice infused syrup ? BTW. I love the website. I am from India. But my favorite food is from the Mediterranean. 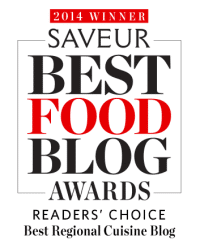 Greek, Lebanese , Spanish…etc etc..
Hello, and thank you! 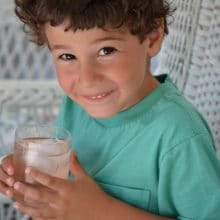 Ziyad is a trusted brand, but if the orange blossom water doesn’t smell good to you, go right ahead and make simple syrup with fresh orange juice (not at all the same flavor as orange blossom water, but it will taste good! )–or instead even better, a drop or two of rose water. Vanilla simple syrup would also be good here, or coconut with the extract.